San Diego is a vibrant, metropolitan city with a laid-back, small-town feel, and no other San Diego neighborhood embraces this best-of-both-worlds spirit like downtown. Neatly packed into a single square-mile grid between the 5 freeway and the Harbor, downtown San Diego has it all: soaring skyscrapers bustling with big business, old turn-of-the-century buildings housing trendy new nightclubs, and peaceful parks perfect for a short stroll or a relaxing rest. Visitors and residents alike can enjoy dining in Little Italy, shopping at Horton Plaza, taking in an opera at the Civic Center, exploring an aircraft carrier at the Harbor, and dancing in the Gaslamp Quarter, all in the space of a few dozen city blocks. Close to the international airport, cruise ship terminal, Balboa Park museums and world-renowned San Diego Zoo, downtown is a fine place to begin your visit to America’s Finest City. Finding your way around downtown San Diego by car is fairly straightforward. But, as in any city, be prepared to navigate a few tricky one-way streets, and, once you get where you’re going, you’ll have to find a place to park or hire a valet service to find one for you. The best advice is to know before you go—figure out where you’re going, plan out your day, and map out your route. Make advance reservations for prime dining hours at popular restaurants. Carry cash and coin for the many self-pay lots and parking meters around town. There are also several large parking structures serving Horton Plaza, the Gaslamp District, the Ballpark and Convention Center. San Diego downtown has many cultural attractions, various fun activities and outstanding dining and cuisine selections for everyone. 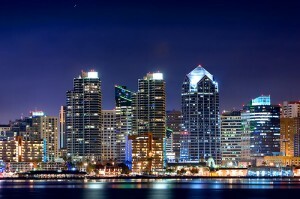 Downtown San Diego also possess great historical heritage. 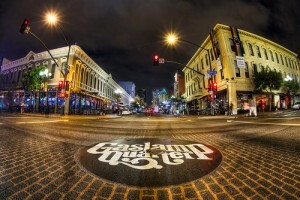 You will be able to walk and take photos of contemporary and historic architecture at famous Gaslamp District. You can also purchase from shops and boutiques, visit exquisite restaurants, rooftop bars and nightclubs of San Diego downtown. The downtown San Diego also offers cultural attractions for groups and families. Taking a tour at The New Children’s Museum, or taking part in a baseball game at the home ground of San Diego Padres, or riding a trolley to the Balboa Park or to the San Diego Zoo will be fantastic experiences for newcomers. All these will help the visitor to feel the essence of San Diego downtown. After nightfall, downtown becomes the ultimate party town. You can get into varieties of posh nightclubs, sip signature cocktail from rooftop bars and enjoy all night long concerts and many more. You will experience an amazing and adventurous night on the town. You can also take a tour to the Embarcadero district, which is located on the west of San Diego downtown. This Embarcadero district is another hot tourist spot. You can visit the cruise terminal, the Navy Pier, Seaport Village, USS Midway Museum, the Star of India, or the Maritime Museum of San Diego. If you are more into seaside experience, get on a harbor cruise but if you want to enjoy on land, take a tour to seaport village. You will love the “Urban Trees” sculptures along San Diego’s Embarcadero. Little Italy is also quite interesting. It is on the north of downtown. Get a cappuccino and enjoy your food while sitting at an outside café. You can try the original taste of handmade pasta with a glass of Chianti. Try to treat yourself by purchasing an Italian artwork as souvenir. Wherever you go, remember to collect souvenirs. Downtown San Diego might be the ultimate vacation spot for you and your family.